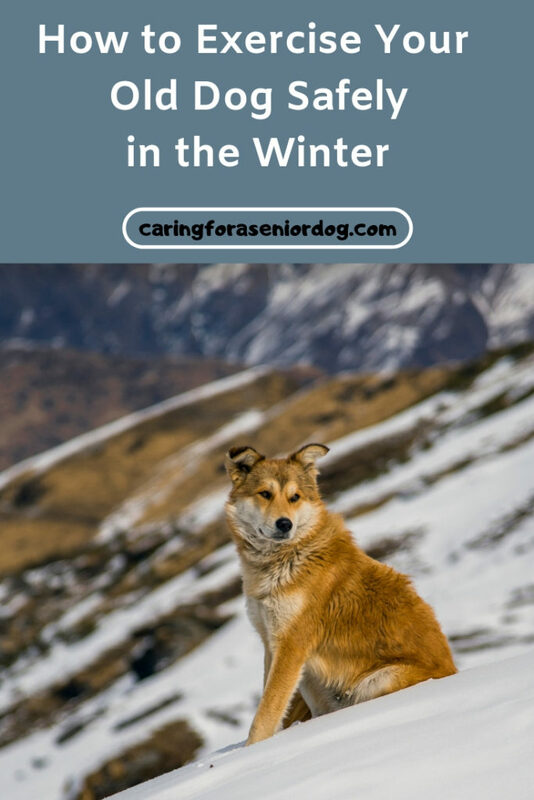 Snow, ice on the sidewalks, wind and freezing temperatures make the outdoors seem like a “no go” area for our old dogs a few months of the year. The flip side of that is the importance of providing our dogs with some sort of physical activity every day, otherwise they can become overweight, stressed and at risk of developing a number of behaviour issues. So how do we make a walk in the great outdoors bearable? All my old dogs came from a shelter I used to volunteer at in Florida, so you could say they did better in warmer weather. Since we spent several months a year in England, and now live here pretty much full time, they had to adapt to cooler temperatures. While there are some days when it gets very cold, it’s nothing compared to other places, namely Canada where I’m from. We don’t get snow in our area so a sweater and coat are enough to keep my pups warm. Having said all that, nothing prepared my sweet girl Red for a week spent in Toronto in January!! 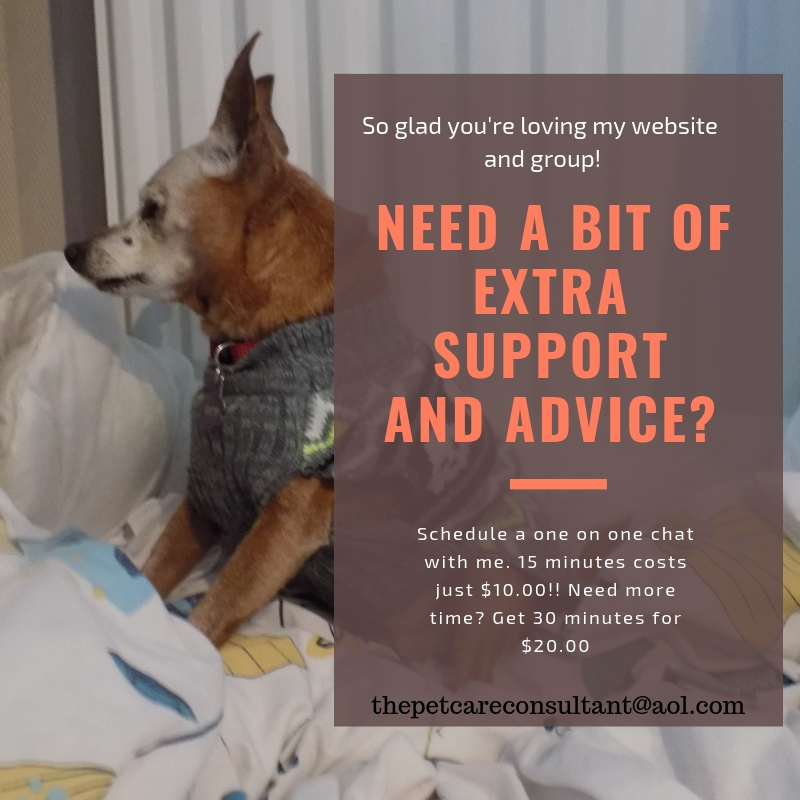 I wish I had taken pictures, but back then I didn’t know I was going to have a senior dog blog, and how helpful it would have been to document our lives more carefully. That was really hard on my poor little mite. She was only a small 9lb thing with skinny little legs, so she found it challenging, okay more than that she found it impossible to walk. Add to that salty streets and sidewalks, the best I could hope for was getting her outside to pee and poop. Her stubborn refusal to wear booties didn’t help, but thankfully she did finally agree to paw wax. You may be asking why I even took her there in January. I had to go because a family member had died, and I didn’t have anyone to care for her at such short notice. Older dogs tend to feel the cold more than in their younger days, so keeping them warm and toasty is key. You definitely have to invest in a nice thick warm coat, and if that isn’t enough make sure they wear a sweater as well. I know most coats don’t cover a dog’s underside, and our poor pups end up wet and cold. A few years ago I found an amazing warm raincoat on Amazon, that actually had a piece that covered that whole area. Boy was I excited. I know a sweater will cover it for warmth, but this piece was waterproof!! For extra warmth why not look into adding a pair of doggie pants to keep your pup’s legs warm, or a onesie to cover arms and legs. You know those little hand warmers you put in your gloves? Maybe you can find a way to add it to the inside of your dog’s coat. Be careful it’s not near his skin where he could get burned. Having more than one of each of the above means you’ll always have something dry to put on your dog. Sorry for stating the obvious! The warmer your dog is the greater the chance he or she will be willing to venture out more often…even if it’s just 5 minutes at a time. After warmth, paw protection is the next thing to think about. Your dog may dislike or be uncomfortable walking on very cold or wet ground, and we all know how painful salt can be on their paws. One option are booties and if your dog is cool (sorry, no pun intended) wearing them that will make a huge difference. They will keep him warm and protected and again, increase the chances he’ll want to go for a walk. Not all booties are created equal, so before you buy make sure you can return them or try them on in the store. Just because your dog isn’t happy with one pair doesn’t mean he won’t agree to another. Be sure the ones you choose have good traction. If your dog refuses to have any part in that, try a tub of paw wax, it does help. Snow and slush are easy to see, but what about black ice? How about hard snow under the soft powder? Holes? Sharp objects or other hazards? Okay I know a winter walk doesn’t have to sound like a stroll through a war zone, but we all know how challenging walking in snow and ice can be. Even more so for our old dogs who may not be as sure footed as they once were. If your dog is going to walk or run off leash think about what lies beneath. Do you ever notice the exertion needed to walk through snow? Imagine how that can feel to our dogs, particularly if they have heart or lung issues, or are less than steady on their feet in the best of times. If your dog does have these types of issues, please consult with your vet about the safety of walking him in cold and snowy conditions. Even if your dog usually walks or runs off leash, if you’re out before the snow has been plowed, you may want to think about sticking to slower, on leash walks. The first thing you’re going to want to do when you walk in the house is take off your dog’s wet clothes, and dry him off. Be sure to wipe his paws if he wasn’t wearing booties, you don’t want him licking off the wax or salt. When putting on a new sweater you may want to leave it in front of the radiator or fire for a moment or two to warm it up a bit. Don’t forget to offer him a nice drink of room temperature water. Despite our best efforts, and the wardrobe we’ve invested in, sometimes it’s just too cold for them to walk. Hopefully they’re still able to pee and poop outside, or you’ve set up pee pads for that. So how do we stop our dogs from going bonkers from boredom? Here are few ideas. Do you have a treadmill? It’s a great way to get him moving and burn off some energy. Start off at a super slow speed and see how he does. Invest in a puzzle toy or make your own. Mental stimulation is a great way to help burn off energy. How about loading him into the car for a lap or two around a big box pet supply store or Home Depot if they allow? He’ll get some exercise, sniff around and maybe even make a friend or two. Stock up on supplies while you’re there and it sounds like a win for everyone. If your dog is still in great shape and has no trouble with stairs, stand at the top, throw him a favourite toy and have him bring it to you. After a few sessions he’ll be ready for a break. If you have too many stairs stand or sit halfway. Grab a hula hoop and have him walk through it. The height you hold it off the ground will depend on his mobility. Hide some favourite treats and have him find them. 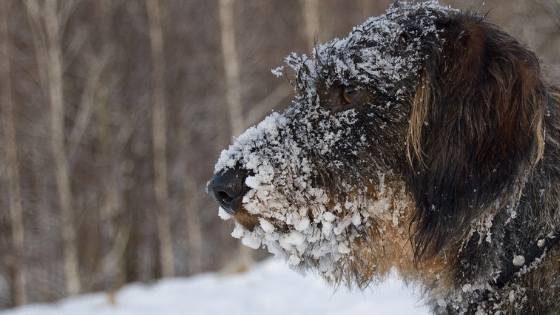 How do you exercise your old dog safely in the winter? How do you make sure your dog gets enough exercise in the winter? Sharing helps others so please leave a comment below, or on my Facebook page. I haven’t had much luck with paw wax, for some reason. I have Musher’s Secret but even when I put it on my boys’ right before we go out, they still both end up limping thanks to the snow, cold, and salt. Ah well…boots it is for us. The wax at least keeps their paws nice and soft. It’s been super cold here this week and I’ve been noticing my 10 year old dog seems to be getting colder faster than my younger boy. We’ve pretty much been going out for quick potty breaks only. I do nosework, training, and play with him indoors. I guess it’s one of those things – trial and error. If they agree to boots they’re even better. I was shocked my dog allowed it to be honest. It certainly didn’t mean we took long leisurely walks, but at least she was able to go out to pee and poop. I know you have to get creative about entertaining dogs during these super cold weeks, sounds like your dog is still having fun! The puzzle toys & paw wax definitely come out in the freezing cold Winter! My Husky Icy loves the cold but not little Phoebe, she loves the heat. It’s so important to keep dog safe in Winter, there are so many perils. I can imagine Icy has a blast (no pun intended) at this time of year. Thank goodness there is no snow in San Francisco but Layla hates the rain so I have started letting her tell me when she wants to go and we immediately go outside. Another solution I have found is that she loves the supermarket and there is one not far from me so if I say lets go shopping she is ready to go out, she hates clothing so I keep the raincoat near the door because if she sees it she will not go. I always dry her down when we get inside plus treat her extra for doing that. Wow, you have a supermarket that lets dogs in? How amazing is that! We have never had much luck with booties for Ruby. She won’t walk in them – though fortunately, she loves jackets and sweaters. We live in the Chicago area and are just finishing a week with temps averaging -30 below zero. Poor Ruby wanted to go out, but it was just too dangerous for her. Poor Ruby but you’re right it’s safer indoors. Luckily there are so many ways to entertain them inside, or take them to a big store like Home Depot or PetSmart and let them walk around there. Excellent post! It’s so tough to find dog coats that actually cover the belly and chest areas. I always layer them, but I try to keep potty breaks short anyway. You’re right, most coats don’t cover the underside of the dog. A few years ago I actually found an amazing warm raincoat on Amazon, and it had a wide band that covered that whole area. You can imagine who excited I was because it kept Red so much warmer. We didn’t have luck with the wax – but the PAWZ work really well for us so we went with that. We have snowsuits. Made in Finland. SO warm, 100% wind proof et all. But here it goes down to -40 … and that’s just dangerous for breathing! We do a lot of indoor agility training this time of year! That’s a great idea to have snowsuits, makes sense. You’re right, too cold and it’s dangerous for breathing, it’s good there are so many ways to help them exercise indoors. I think paw protection is so important. I cringe when I see dogs walking in the snow with unprotected paws, especially on salt. Red looked so adorable in her winter coat. I know what you mean. I’m surprised dogs can tolerate it. Bless her, she looked adorable in anything she wore! Buffy is a senior cocker spaniel and she does not like to walk. But it is good for her, so we are outside no matter what the weather, although sometimes we cut the walks very short. Her being blind doesn’t help, so she tends to lag way behind. I do cover her up with a sweater and coat, and booties if she needs them. None of my dogs have ever liked booties, I just put them on and they get used to them. They do take some getting used to. I think exercise helps her arthritis. I loved your tips and especially the video about how to walk a dog on a treadmill. My vet recommended to try Buffy on one, but I don’t own one. Besides, both of us would rather be outside. I’m sure Buffy feels so much better with the layers. Exercise definitely does help with arthritis. Are there any supplements she’s on to help, or acupuncture/laser treatment/hydrotherapy? I agree, nothing beats fresh air. We love this post! When we’ve adopted seniors we’ve had to shovel out areas and let them go out to potty. Exercise is completely different – the mental games are a nice addition! We also like the doggy treadmills – but since we hate treadmills, we thought they might be boring… But unsure. The layering up and coats are always good, as is putting on their little booties and just going outside! Oh bless you, I’m sure they were grateful for that!! So many ways to help get our seniors out and about in the winter, it just requires some planning…and shoveling! Snowsuits makes sense and paw protection. It’s summer here and I am seeing dogs walking on hot pavements and I am muttering “REALLY lady, put boots on the animal” Weather extremes bring out the most thoughtless people!!! You’re right about extremes of weather. When we lived in Florida, although Red was from there and loved the hot weather, during the hottest parts of the day she preferred walking on grass to hot pavement. I can imagine their closet!! I’ve never seen snoods for dogs, but that’s a great idea. I knitted a little scarf for Red but this sounds like a much better idea. Glad the weather doesn’t stop you from hiking. Jasmine loved cold weather and loved snow. Other than paw care, and a coat when she was shaved for surgery, we didn’t need to take any special measure in the winter. I have never seen Jasmine get cold other than rarely her feet. The fact that Jasmine did so well in the winter must have made things so much easier! At least you didn’t have to worry about how to keep her busy indoors. Having fallen on the ice myself a few years ago which eventually required surgery on my knee, I can support the need to watch your senior dogs carefully in icy weather. Oh my goodness, poor thing! I remember all those winters I spent in Montreal and Toronto, feeling like I wanted crampons on my boots! These are really good suggestions. When it is bitterly cold or icy, we stay inside except for brief excursions to the back yard. Theo loves to play tug of war, and all the dogs enjoy their puzzle toys. Sometimes they will walk on the treadmill too, but they don’t really like it. Tug of war is a great way to burn off some energy, and so do puzzle toys if they don’t solve them in seconds! I can’t imagine Jack would go near a treadmill. I’m super jealous of Layla’s mom who has a supermarket that will let pets in! This cold is definitely kept us inside. I’m not comfortable walking on ice myself and having anyone on the end of a leash walking with doesn’t sound fun. I am too!! Imagine being able to do your grocery shopping and take the dog along with you. I grew up in Montreal so am all too familiar with sliding along the icy sidewalks. If you have a dog that tends to pull I would definitely be a bit concerned about that! Hello! Your articles helped me a lot! I am so lucky to find your site. I don’t have luck with those booties either! My dog would wear them if they fit well but they tend to come off easily. If anyone have a success with booties for small dogs, please let us know! My dog is poodle. She hates warmer weather and used to love cold weather, but now she starts shaking when it’s cold. 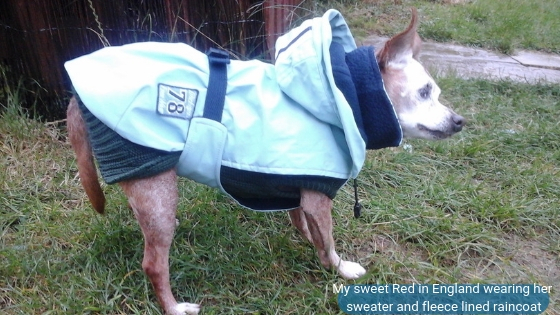 Now she has thin fleece, thick coat, sweater and rain coats. They can be layering! When it’s raining so hard, we wait until rain stops, but sometimes we walk under the school building that has covered roof! There are lots of different types of booties, sometimes you have to try a few but you have to be sure you can return them or it costs a lot of money. When dogs get older they don’t handle the cold like they used to, sounds like layering is the answer! !